We did all but the locks twice. Pontcysyllite is 126ft above the river dee, there is no railing on the non tow path side as you can see in the pictures. First time I did this several years ago it was quite a white knuckle ride now I get to laugh at the walkers holding on to the handrail as if a 208 year old well maintained structure is going to fail at any second. The Title picture is us crossing the 4 year older and much less scary Chirk aqueduct back from Wales to England. Now moored up at the Poachers Pocket thats been renamed to the very pretentious sounding “Perfect Poachers Rotisserie” Will it live up to this name? We will find out later. 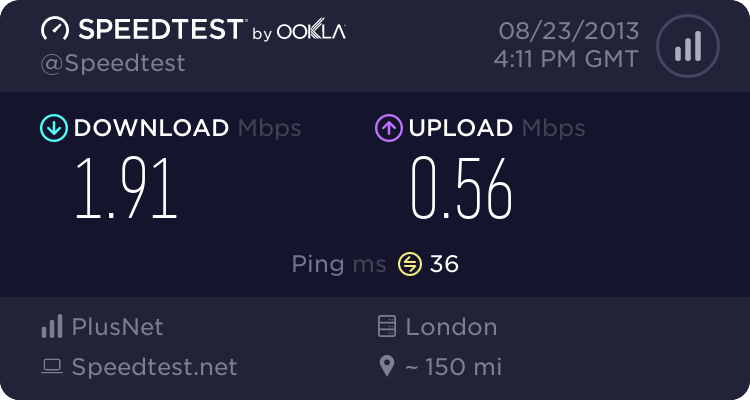 I will give them one thing the free wifi is pretty good, I’m sitting a good 150ft from the pub and still have full signal and it feels pretty fast too. Well it is compared to the next to useless mobile service I have had to endure for the last few days. Here is a speedtest just so you get the idea.